The final step in creating an active Fraud Policy is the assignment of the controls, rules and filters to a merchant account. Step 1: Select the Assign Rules and Filters from the FBI Tools menu. Step 2: Select the applicable Merchant Account. Tip: to find the rule use the set of filters - Status, Assigned, Global Rule. Step 3: Click the box next to the control, rule or filter being assigned. Step 4: Click on Save. Step 5: Click on Apply to all Merchant Account button to apply to all accounts. Tip: To Cancel all changes prior to Save click Cancel. 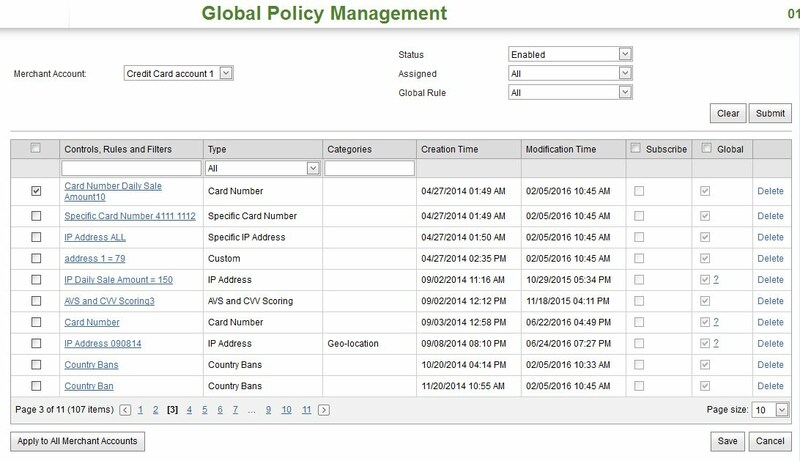 User is able to mark any rule as Global by checking the appropriate checkbox and pressing Save button. After that the administrator will review this rule and approve it and it will become Global. Global rules can be assigned for other merchant companies by the administrator. User can delete controls, rules and filters by clicking Delete button. Note, that user can delete rule created by himself and can not delete Global Rule, if it was created by admin or other users.